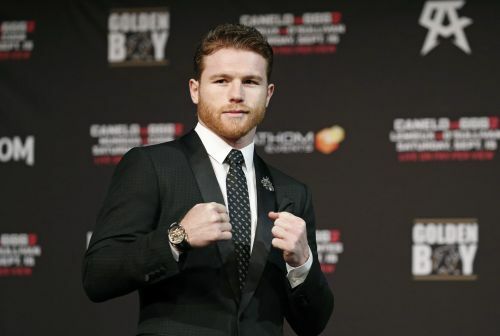 LAS VEGAS (AP) — Canelo Alvarez has gone to bed the last few months thinking about how he's going to knock out Gennady Golovkin in their middleweight title rematch. To wake up Sunday morning as the 160-pound champion, though, he'll have to take some chances he didn't in his first fight with Golovkin a year ago. And that could be a real problem against a fearsome puncher who has knocked out 34 fighters in his 39 professional fights. "I know it's going to be a tough fight," Alvarez said. "But I'm going in there to knock him out." Alvarez and Golovkin get another chance to settle what they couldn't last September when they meet in a rematch of their first fight, which ended in a draw. They do so Saturday night on the Las Vegas Strip not as the gentleman fighters they portrayed themselves to be then, but as bitter rivals who legitimately seem to dislike each other. That showed at Friday's weigh-in, when the two fighters had to be separated in their only face-to-face appearance before the fight. Golovkin weighed 159.6 pounds and Alvarez weighed 159.4. A positive test by Alvarez for clenbuterol forced the rematch to be postponed from May. At the same time it produced some hard feelings between the two fighters over Alvarez's contention that it was caused by eating contaminated meat in his native Mexico. Whether that translates into a more entertaining fight remains to be seen. But both fighters seem determined not to let it be decided by the ringside judges. "It's a real fight," Golovkin said this week. "Like a real war." Golovkin (38-0-1, 34 knockouts) is a slight favorite in the rematch, much as he was in the first fight. Many at ringside thought he won that bout, but Alvarez pulled off a draw by winning the late rounds as the 36-year-old Golovkin seemed to fade. The fight wasn't the "big drama show" that Triple G likes to talk about, with neither fighter down and neither fighter really hurt. But it was a tough, competitive matchup that delivered in other ways even without a winner at the end. "I had a great experience from the first fight," Golovkin said. "It's a little bit different this time, but I believe it will be a big fight for the fans." Alvarez (49-1-2, 34 knockouts) believes that, too, but sees a different result. It's one he's envisioned nightly in bed as he goes over scenarios that will help him win. "Every night in my bed before I go to sleep I visualize what I need to do to get the knockout," Alvarez said through an interpreter. "I know it's going to be a tough fight." The fight, which carries a pay-per-view price tag of $84.95, is big for the careers of both men. But Alvarez may have more at stake than Golovkin, the puncher from Kazakhstan who has held pieces of the middleweight title for eight years. The most popular fighter in his native Mexico, Alvarez has taken a hit from some of his rabid fans both for testing positive and for not fighting more aggressively. He can only talk about the doping that got him suspended for six months by Nevada boxing authorities, but he can do something in the ring to alter the perception that his style is too conservative. Golovkin trainer Abel Sanchez hopes he does just that. "He's promised the fans he's going to knock him out but in order to do that you have to be in range and then it gets dangerous," Sanchez said. "In order to win a fight you have to want to win a fight." Golovkin has — mostly through his trainer — tried to goad Alvarez into taking more chances in the rematch, claiming the Mexican star ran in the first fight. A more stationary Alvarez, of course, would make him easier to hit, but Alvarez is more comfortable as a boxer and counter puncher and used those skills to his advantage in the first fight. The first fight delivered not only in the ring but at the cash register, with a $27 million gate and 1.3 million pay-per-view buys. The rematch is sold out, but a lackluster promotion might make it more difficult to sell as many pay-per-views as the two fighters did when they first met.